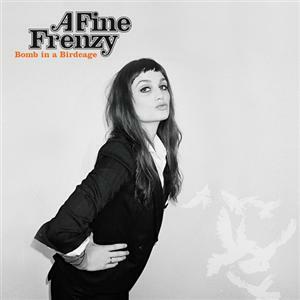 The latest release from A Fine Frenzy isn’t too much of a departure from their first album. In places, the beats are a little harder, the bass a little louder, but at the heart of the album are the simple yet often heartbreaking lyrics of Alison Sudol. This shouldn’t come too much as a surprise, though, and it’s not a bad thing. After all, it’s not like Sudol is likely to ever take some leap off the deep end and start experimenting with heavy electronica or anything. (Although if she did, I’m pretty sure I’d check it out anyway.) Some of the songs seem to be a bit more upbeat than the ones found on One Cell in the Sea, all of which really had the same gentle indie pop sensibilities. The album gets off to a great start, with the pretty harmonies and handclaps of “What I Wouldn’t Do”, which contains the line that gives the album its name: “With my heart ticking like a bomb in a birdcage, I left before someone got hurt”. The first single, “Blow Away”, is an energetic and captivating pop tune. Bomb in a Birdcage is an easy album to get lost in; this is both good and bad. Several times while listening, I realized that I’d completely zoned out and missed several songs, so I had to go back and re-listen. Sudol’s vocals are beautiful and soothing, which contribute to that ease-of-getting-lost feeling. The album’s not forgettable, but there also aren’t any songs that I’ve got stuck in my head after a few listens. Bomb in a Birdcage is an excellent sophomore release from A Fine Frenzy, containing enough new-sounding material to keep the music from being stagnant, but not being so radical a departure from what fans expect as to turn people away. It’s definitely worth a listen, at the very least, and I can already tell after listening to it a few times that it is starting to grow on me. Bomb in a Birdcage was released September 8, 2009, and is available just about everywhere. Stream the album on their official website, then buy it if you like it!